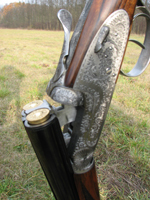 The heritage of European hunting estates are steeped in the traditions of hunting and shooting in Czech and Slovakia. Here is a land that truly understands and welcomes the hunter. We are here for those who believe that life is too short to waste time on the second-best. Besides the advantages of being literally your local hunting outfitter for The Czech Republic and Slovakia, our discerning hunting syndicates enjoy bespoke travel services, personal assistance, selection of prime trophies, treats and practical advice that we believe will make a serious difference for the gun, when hunting in Europe. Our professional game hunting guides have a wealth of experience in the preparation of corporate hunting packages or individual stalking trips, and their knowledge mean that whatever game trophy you like, be it driven pheasant, duck, wild boar with a pack of wolfs, royal trophy red stag, fallow, roe deer, sika, bear, or the word record trophy mouflon, everyone is talking about – Shooting Enterprise will deliver. What's more, we provide you during your hunting travel with unlimited access to an unrivalled personal hunting guide providing specialist advice and local knowledge. Our mission is to bring you only the very best whether it be hunting guide, game trophy, taxidermy, private Chateau accommodation, fine food, entertainment or for the non hunting guest spa treatments, opera, music, art. Hunting and shooting in the heart of Europe in Czech and Slovakia offers driven or walk up pheasant, wild duck, wild boar and hog, individual mouflon red deer, roe deer, fallow deer, sika dybowski, sika japanese, bear, wild boar, wolf, fox, hare, badger and fly fishing. Start planning a truly exciting shoot in magnificent surroundings. Call us now on +420 608 321 477 or complete this form. We'll be delighted to assist anytime. More hunting information is available on these pages: deer, red deer, roe deer, fallow deer, muflon, bear, wild boar, wolf, duck, fox, hare, badger, pheasant, fishing, non gun, wingshooting.